As the United States nears an agreement with the Taliban to end the war in Afghanistan, which began in 2001, it's time to look at what the future could hold for that country and Iraq. Heather Selma Gregg is an associate professor at the Naval Postgraduate School’s Department of Defense Analysis. She is the author of The Path to Salvation: Religious Violence from the Crusades to Jihad (Potomac Books, 2014) and coeditor of The Three Circles of War: Understanding the Dynamics of Modern War in Iraq (Potomac Books, 2010). She has spent time in several regions of conflict, including Palestine/the West Bank, Croatia, and Bosnia. 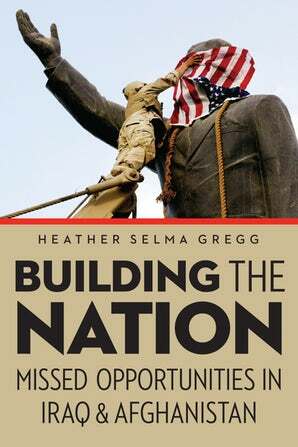 Gregg's new book, Building the Nation, draws from foreign-policy reports and interviews with U.S. military officers to investigate recent U.S.-led efforts to “nation-build” in Iraq and Afghanistan. She argues that efforts to nation-build in both countries focused more on what should be called state-building, or how to establish a government, rule of law, security forces, and a viable economy. Considerably less attention was paid to what might truly be called nation-building—the process of developing a sense of shared identity, purpose, and destiny among a population within a state’s borders and popular support for the state and its government. Gregg writes, "State-building programs aimed at creating governance need to begin with popular perceptions of leadership and its sources of legitimacy. In particular leadership should begin at the local levels, including civil-society building and examples of leadership rooted in the will and welfare of the people. (Ashraf) Ghani and (Clare) Lockhart identify national programs as a potential vehicle for civil-society building, leadership development, and popular participation that could help foster legitimate governance over time. They cite examples like the 1944 GI Bill for World War II veterans in the United States, the creation of the U.S. Interstate Highway System initiated by the Eisenhower administration in the 1950s, and the creation of the National Solidarity Program in Afghanistan as examples of state-building programs that linked the population to the government and worked within existing norms to foster good governance. "National programs that teach and reinforce good governance should - like all the other pillars - focus on the role of the population in governance; specifically, it is the people who are the sovereign of a country, not the head of state or the territory, and popular-based rights and responsibilities accompany good governance. State-led programs that reinforce these points could include leadership building as a component of education through school councils, elections with goal setting, and accountability. Furthermore, the education system could emphasize historic examples of responsible and legitimate leadership; these examples could be further reinforced by national monuments that heroicize the nation's good leaders." According to Gregg, efforts to stabilize states in the modern world require two key factors largely overlooked in Iraq and Afghanistan: popular involvement in the process of rebuilding the state that gives the population ownership of the process and its results and efforts to foster and strengthen national unity. Gregg offers a hypothetical look at how the United States and its allies could have used a population-centric approach to build viable states in Iraq and Afghanistan, focusing on initiatives that would have given the population buy-in and agency. Moving forward, Gregg proposes a six-step program for state and nation-building in the twenty-first century, stressing that these efforts are as much about how state-building is done as they are about specific goals or programs. Gregg argues that "state-building efforts in the modern world require two key factors that were missing from U.S.-led operations to build viable states in Iraq and Afghanistan: popular involvement in the process of rebuilding the state that gives the population 'ownership' of the process and its results; and efforts to foster and strengthen what will be called national unity. "State-building needs to start with the population for several reasons. First, now more than ever, a state's sovereignty rests with its people, and without their buy-in, states are unlikely to thrive or governments to succeed over the long haul. Sovereignty has undergone a series of shifts from the time of the creation of modern states in seventeenth-century Europe to the twenty-first century. No longer is a state's sovereignty defined by monarchies, or territory and borders, or just the monopoly on the legitimate use of force. the birth of modern-day democracies, the creation of security through the levee en masse, the rise of private property, the increase in levels of literacy and education, the emergence of the public sphere, the ideas of the Enlightenment, and the revolution in information technologies have shifted sovereignty from governments and territories to the people. Perhaps unlike ever before in history, people have the power to determine the viability of the state in which they reside, and excluding them from the process of state-building - including the development of its government, law, security forces, economic viability, and social well-being - is likely to undermine the long-term stability of the state. Efforts to state build, therefore, need to start with the people. "State-building efforts also need to start with and include populations in order to create programs that resonate with the population and give it ownership of the effort in the here and now, which will pave the way for a population that supports the state and its various institutions. As will be described, intervening powers in Iraq and Afghanistan largely predetermined how the state would look and what should be built and why. This approach, while expedient, did not start by trying to understand the population' vulnerabilities, needs, or hopes, nor did it understand their perceptions of security or leadership. In many cases efforts taken by intervening powers actually worked against the population' needs and fueled perceptions of mistrust and insecurity. For example, decisions made by U.S. civilian leaders to disband the Iraqi army and punish members of the Baath party effectively excluded Sunnis from the state-building process and sent a strong signal that they would not be part of the new Iraq. These decisions have been credited with fueling the rise of some of the insurgent groups that emerged in the country. Within this top-down approach to state-building, the United States and its allies missed valuable opportunities to partner with the population, foster leadership and decision making, and put the country to work after decades of dictatorship and war. Ultimately, the population needs to have ownership of the state-building process and see the state as its future and the endeavor to succeed." Building the Nation is one of the most comprehensive books you will read about the United State's efforts to nation-build in Iraq and Afghanistan, with a detailed look at the way forward as we wind down our presence there.